Today, we have Jyoti from Panch Pakwan is with us. Jo's blog completed 200 posts recently and she is blogging for more than an year now. Now, let us hear from her. Nithu's Kitchen : Tell us about you Jyoti. Jyoti : First, let me thank Nithu for this wonderful opportunity. I felt happy, when she asked me for a guest post. Now about me...My name is Jyoti. I had lived in Karnataka and Maharasthra. I love to cook and eat as well. My love for food started when I was outside my home for education and that was time when I understood the meaning of FOOD, FAMILY & FRIENDS. Nithu's Kitchen : When did you start your blog? Jyoti : It's almost one and a half year and when I look back now, I really feel so happy. I never ever thought I would complete 200 posts so soon!! Nithu's Kitchen : Congrats Jyoti for completing more than an year with 200 recipes in this bloggy world. What made you to start a blog? Jyoti : I started my blog basically to store all authentic recipes shared by my Mother, Aunts and Friends. Nithu's Kitchen : What type of cuisine does your blog focus? Jyoti : As I had lived in Karnataka and Maharasthra, my blog is influenced by both the states cuisines. You can also find some new recipes that I learnt after coming here. Jyoti : From my college days. Nithu's Kitchen : Do you remember the very first dish you made? Nithu's Kitchen : Heard you had an unforgettable incident related to Kadi preparation. Share us that incident. 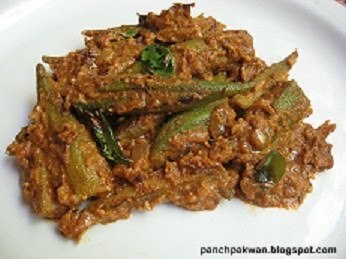 Jyoti : I am sharing a recipe for Bhendi / Okra Masala. Nithu's Kitchen : Why did you select this dish. Jyoti : Being vegetarian I love to try simple recipes with new twist. Bhendi sabji is one of my favorite and I have use cashew nuts instead of peanuts in the recipe. 1. Heat the pan with oil, add cumin seeds , allow them to splutter. 2. Add onion and fry till they turn light brown color. Add tamarind paste, jaggery, salt, turmeric powder, red chili powder and fry for 3-4 minutes. 4. Stuff this above made masala paste into bhendi. Heat the pan and place these stuffed bhendi. If masala paste is left then add this paste too. Add some water. Cook till the bhendi turns soft. 5. Once the sabji is ready. Make the tempering and pour over the stuffed bhendi masala. 6. Serve with hot chapati/ roti / rice. Nithu one more wonderful guest post with one more lovely guest.Nice to know more about you Jyoti. Its good to know more about you jyoti.Bhindi is one veg I am not too keen on but looking at your recipe I feel I want to try it.Dish looks wonderful and I love the spicy gravy coating the bhindi. Nice to know about Joyti Nithu. Her dishes are always good. This one is very nice. Nice knowing about Jyothi..Bindi Masala looks so good !! It was really nice knowing about Jyoti..Great post, Nithu..
Great Post Nithu. Nice to meet another blogger too. The okra curry looks great. Loved reading Jyothi's interview and thanks for the introduction Nithu. The bhindi masala looks awesome.